In advertising, a slogan can mean more than words. A clever catchphrase can catch attention and pay off in steady sales. While some tag lines stay etched in our minds, sometimes the times or the target market demand that a brand update its tag. 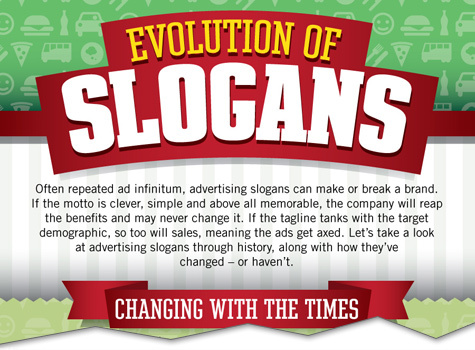 To see which slogans have had staying power and how some others have changed over time, BestMarketingDegrees.com followed the phases of catchphrases. 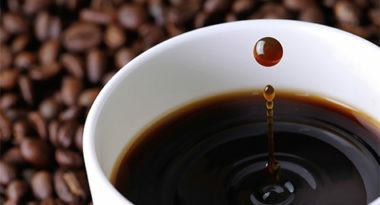 Some brands have built their business on savvy slogans with stamina. Their words have been able to reflect and affect their target over time, so there never was any need to mess with their message. They got it right the first time, so they never gave it a second thought. Check out which well-worded slogans have been able to last the longest. DeBeers’s slogan, “A diamond is forever,” has kept people engaged for 67 years. “We try harder” has worked hard for Avis 52 years. Nike has run with “Just do it” for 21 years. “What happens here, stays here” has stayed here with Las Vegas for 11 years. Fast food is a fickle segment that’s known to change with tastes and trends. That’s why three of the most popular chains have sampled various slogans as they tried to entice fast food lovers and rise to the top of the food chain. “Have it your way” was Burger King’s reigning slogan since it started in 1974, but the chain cooked up a few other options like “Best darn burger” in 1978 and “The Whopper says” in 2001 before returning to its original in 2005. McDonald’s thought they’d struck gold with “Look for the golden arches” in 1960, but tweaked their tagline half a dozen times over the years before falling in love with their latest, “I’m lovin’ it,” in 2003. Wendy’s has dished out almost a dozen different slogans to reflect the tastes and the times, from “Quality is our recipe” in 1970, to “Where’s the beef?” in both 1984 and 2011, until finding their best in “Now that’s better” in 2012. Some brands let tag lines do the talking, but when a brand’s slogan no longer speaks to its target market, it’s time to rework their slogan to make it work with world we live in. In 1978, FedEx’s first slogan emphasized timely delivery, but evolved into “The world on time” in 2009 to reflect the global economy. Verizon’s original slogan in 2000 was based on dependability, but the brand has connected to modern mobile needs with “Rule the air” since 2010. Coca-Cola and Pepsi have been around for more than a century and their battle for brand preference began at the beginning. With sodas so similar, it’s their slogans that defined their difference. And both brands sampled many slogans to continually reinvent themselves. From Coca-Cola’s “It’s the real thing” to their current “Open happiness,” and Pepsi’s “Any weather is Pepsi weather” to their present-day “Live for now.” Yet they were all created to quench their thirst for soft-drink dominance. Catch attention for your brand with a creative slogan. Contact MDG Advertising today at 561-338-7797 or visit mdgadvertising.com. MDG Advertising, a full-service advertising agency with offices in Boca Raton and New York, NY, is one of Florida’s top branding firms. MDG’s core capabilities include print advertising, direct mail marketing, branding, logo design, creative, digital marketing, media planning and buying, TV and radio advertising, Web design and development, online video advertising, email marketing, content marketing, social media marketing, and SEO. To learn about the latest trends in advertising and branding, contact MDG Advertising today at 561-338-7797 or visit mdgadvertising.com.